I really enjoy mulching my flower and vegetable beds. I like the smell of mulch, how it makes my garden beds look and mostly how I know that it will break down and do wonders for the soil and the plants. The main reason I mulch is to keep the soil cool by helping it to retain moisture, suppress unsightly weeds and help to prevent soil erosion. There are two main categories of mulch. Organic mulch is made from natural materials which means they decompose naturally. Some of these include compost, straw, leaves, grass, manure, sawdust, woodchips etc. On the other hand, inorganic or synthetic mulch does not decompose naturally, these are made from synthetic materials, the most popular ones being plastic sheeting, rocks, gravel, rubber chips and landscape fabric. Both inorganic and organic mulch have pros and cons. The type you choose will depend on a few things including the climate in your area and your budget. To some extent, your gardening skills, or dedication to gardening will play a role in the type of mulch you choose as well. Inorganic – People tend to go this route because inorganic mulch requires less frequent reapplication than the organic versions. This low maintenance quality is ideal, especially for commercial spaces. Inorganic mulch can also be more aesthetically pleasing than organic mulch and some even do a decent job of blocking weeds. However, one major disadvantage is that this type of mulch does not add any nutrients to the soil – some can even block nutrients altogether. This option also tends to be more expensive and harder to install, and some inorganic mulches require a chemical spray to help reduce weeds. Another downside to inorganic mulch is that it is hard to add plants to a garden that is already topped with inorganic material. Organic – As you might imagine, this mulch delivers more benefits than the synthetic versions. Since these materials break down into organic matter, they nourish the soil in the process. Organic mulch provides insulation; during the cold winter months they keep the soil warm and during the hot summer season, they keep the soil cool. The drawback to organic mulch is that it does decompose over time, which can attract bugs and termites. It is recommended that you apply a fresh layer of organic mulch at least once per year! What Are The Best Types Of Organic Mulch? Keep in mind that the best type of organic mulch for you will depend on what you need it for and your budget. 1. Leaf mulch – Leaf mulch is a very cost-effective option especially if you already have lots of trees in your yard. Keep in mind that you’ll need a shredder or mulching lawn mower as the leaves must be shredded before being used. That’s probably the main downside of going with the leaf option. Another important thing to consider is that if the layer of leaves applied to the topsoil is too thick, it can block air from penetrating the soil. Interestingly, it can also have the opposite effect locking in too much moisture and damaging your plants. 2. Straw mulch – Straw comes from the stalk of cereal crops such as rye, barley, oats or wheat. It is one of the most popular types of organic mulches used today, especially in vegetable gardens. The wheat straw option is usually more readily available, but if you are able to, get rice straw mulch to go with this type because it rarely carries weed seeds. 3. 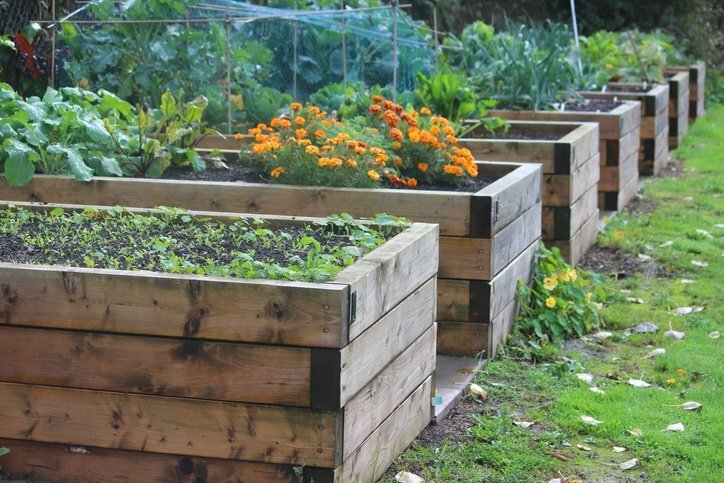 Compost – Another great option for your vegetable garden if you have a compost bin at home. If you don’t it’s certainly something to consider. Compost mulch is a great free option that is also eco-friendly since you are reusing discarded kitchen scraps that would have gone to waste. 4. Grass mulch – As the name suggests, this option is made from grass or rather grass clippings. Your soil will get a boost of nutrients since grass clippings contain 2% potassium, 4% nitrogen, and 1% phosphorus. Two other types of organic mulch include seaweed, which is easily accessible for those who live close to the beach, and cocoa bean hulls. What Are The Best Types Of Inorganic Mulch? 5. Stone mulch – This option is often used for aesthetic purposes as you can get really creative with rocks. It is popularly used in commercial areas because it is low maintenance and actually quite effective at keeping out weeds. It is also an inexpensive option because it can last a really long time. It is a good option if you live in an area such as California that’s prone to wildfires because stones are inflammable, another good point to consider is that in windy areas these work well because they help to prevent soil erosion. Herb gardens and rain gardens are perfect spaces for stone mulch. The downside, however, is that like much of its inorganic counterparts rocks do not provide soil with any nutrients whatsoever; they also do not aid in plant growth. 6. Rubber mulch – This type of mulch has more cons than pros and should not be your first consideration. Rubber mulch rings are often made from old tires, and while it’s sustainable and doesn’t decompose it seems to cause more harm than good to soil and plants. Research from the Royal Forestry Society actually shows that this synthetic or inorganic mulch not only turns tree leaves yellow and can decrease tree growth, it also increases tree mortality. And if you needed more reasons to stay away from rubber mulch, keep in mind that over time the rubber breaks down and toxic contaminants then seep into your soil. Additionally, rubber is highly flammable so if you live in hot areas that are prone to wildfires this can have dangerous consequences as well. 7. Glass mulch – Another synthetic option, which can be quite cheap if you recycle your old glass bottles, and any other glass items you no longer use. However, if you have to actually purchase your glass mulch it can be very expensive – especially if you have a large space to cover. Also, while it is beautiful and blends seamlessly with a modern decor it doesn’t provide the soil with any nutrients. However, this option does allow you to get really creative especially if you use a variety of colored glass pieces. When the sun hits the glass pieces it can be mesmerizing. Much like the stone mulch this option also works best for rock gardens. If you opt for the glass mulch lay plastic on top of the soil before laying the glass; this prevents the mulch from sliding into the soil. 8. Plastic sheet mulch – Often used for commercial spaces or large areas, plastic is also popularly used when growing delicate fruits such as tomatoes, melons, and strawberries. It is easy to apply and remove and is also an effective method for keeping away weeds. Other benefits to the sheet method are that it helps with minimizing soil compaction and root damage and helps the soil to retain moisture. Plastic mulch does have its disadvantages as well, especially when it is used in cool or cold climates. It is not ideal for certain crops such as lettuce and peas that flourish better in cool climates. When plastic sheets are used to cover plants or vegetables with long roots they are not able to draw the adequate amount of water needed. Also, if you regularly depend on rain to water your plants or if you use overhead sprinklers, it’s important to know that the plastic might prevent the water from reaching the plant beds. 9. Paper mulch– If you must go this route, ensure that the paper used is free from colored ink and non-glossy. Studies show that the paper option is more effective when used beneath a layer of hay or some type of organic mulch to prove an effective method of weed control. Otherwise, it is not advised. Use a rake to even out the mulch around the entire area. If you’re working with a small space you can use your hands instead. Make sure you keep the mulch at least an inch away from the root of the plants. Use a garden hose to water your newly spread mulch, making sure not to put too much or too little water. The main purpose of the water is to provide adequate moisture for your soil. The water also tends to weigh down the mulch preventing it from blowing away if the area is windy. Make sure to remove the old mulch at the same time each year and reapply a fresh batch. After a year the mulch would have lost all its nutrients so its very important to re-apply in order to keep your plants and vegetables healthy. Choosing to not mulch your trees, vegetables or flowers can have adverse effects. Without mulch, your garden bed can become overrun by unsightly weeds, but that’s not the worst of it! The roots of your plants are essentially competing with the grass in your yard for water and nutrients, without mulch they don’t stand much of a chance of winning that battle. Without the proper nutrients, your plants will become dry and weak leaving them susceptible to pest infestation and disease. To avoid all these issues, mulching should always be done.